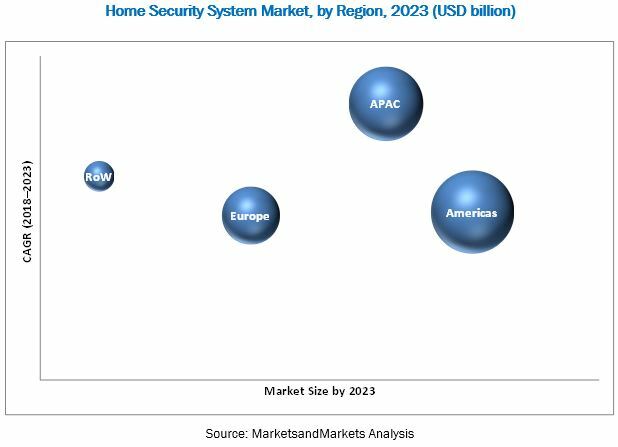 [183 Pages Report] The home security system market was valued at USD 40.66 billion in 2017 and is expected to reach USD 74.75 billion by 2023, at a CAGR of 10.40% during the forecast period. The base year considered for this study is 2017, and the forecast period is 2018–2023. During this research study, major players in the home security system market in various regions have been identified, and their offerings, regional presence, and distribution channels have been understood through in-depth discussions. To find the overall market size, top-down and bottom-up approaches have been followed to estimate the sizes of other individual markets by using percentage splits from secondary sources (such as Hoovers, Bloomberg Business, Factiva, and OneSource) and primary research. The entire procedure includes the study of the annual and financial reports of the top market players and extensive interview of industry leaders such as CEOs, VPs, directors, and marketing executives for key insights (both qualitative and quantitative) pertaining to the market. The figure below shows the breakdown of primaries on the basis of the company size, designation, and region conducted during the research study. Major players in the home security system market are ADT (US), Honeywell (US), Johnson Controls (US), HANGZHOU HIKVISION DIGITAL TECHNOLOGY (China), ASSA ABLOY (Sweden), SECOM (Japan), Robert Bosch (Germany), United Technologies (US), Godrej & Boyce (India), Alarm.com (US), Allegion (Republic of Ireland), Control4 (US), Schneider Electric (France), Legrand (France), ABB (Switzerland), Comcast (US), STANLEY Convergent Security Solutions (US), Nortek Security & Control (US), FRONTPOINT (US), and Vivint (US). 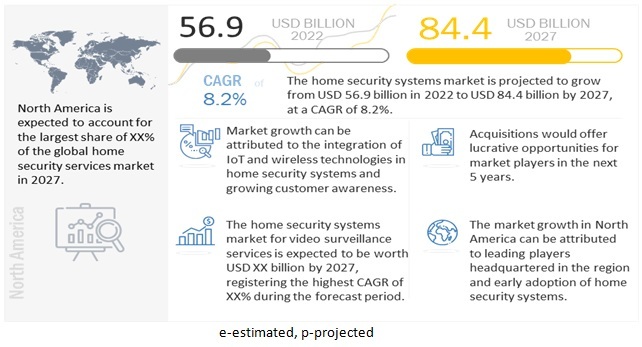 According to MarketsandMarkets, the home security system market is expected to reach USD 74.75 billion by 2023 from USD 45.58 billion in 2018, at a CAGR of 10.40% during the forecast period. The growth of the market can be attributed to the emergence of IoT and wireless technologies, and increasing customer awareness . Video surveillance security systems are likely to hold the largest share of the home security product market by 2018. Among all products, a video surveillance system records all the activities in the vicinity; hence, a user can keep a watch on any untoward activity and alert the police regarding the same; a recorded video footage also serves as evidence in the post-crime investigations. One of the main benefits of the video surveillance system is that it ensures full-time monitoring in both the densely populated areas as well as in remote areas. The surveillance cameras available on the market use AI and deep learning to empower the security with more reliability and accuracy. For instance, Hangzhou Hikvision Digital Technology (China) launched DeepinView Camera Series with the deep learning feature to provide accurate and consistent video content analytics (VCA) performance. The market in APAC is expected to grow at the highest CAGR during 2018–2023. APAC is a technologically and economically developing region, and countries such as China, Japan, and South Korea are driving the overall growth of the home security system market in this region. The technological and economic advancements in the region are expected to drive the overall demand for security systems. In this region, many governments have set the safety norms for various sectors. For instance, the fire hazard is a major concern in this region, and the rapid development of the construction and real estate sector is expected to drive the residential fire protection system market in the coming years. Services are likely to hold the largest share of the home security system market by 2018. The installed security products should be backed with proper services, such as maintenance and integration, for the smooth and continuous working of these products. Security systems are useful only when they are properly engineered, designed, installed, serviced, and maintained; hence, the services segment is estimated to hold a larger size of the market during the forecast period. The high cost associated with the installation and maintenance of home security systems is the key factor limiting the growth of this market. Customers are increasingly becoming aware about the benefits of home security systems; at the same time, they are skeptical of investing in it since the prices of security systems are still not affordable for many consumers. Expensive hardware and the high cost of ownership hinder the adoption of home security systems. *Details on Business Overview, Product & Services, Recent Developments, SWOT Analysis & MnM View Might Not Be Captured in Case of Unlisted Companies. Figure 30 Americas to Hold Largest Size of Market for Access Control Services During Forecast Period.